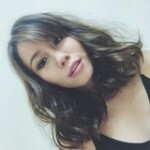 We toured iProperty.com.my’s newly launched 16,000 sq ft office. 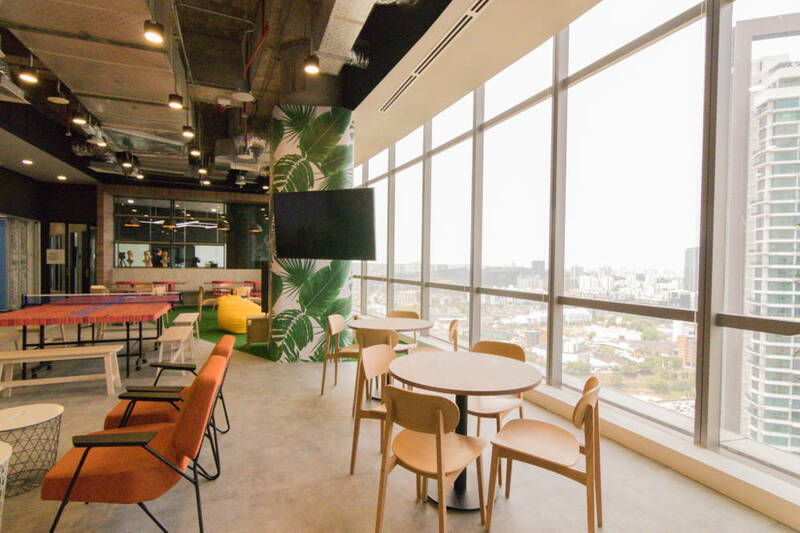 Located at the highest floor of The Gardens South Tower in Midvalley City, the office’s interior design features agile working and gathering areas to encourage collaboration and conversation. 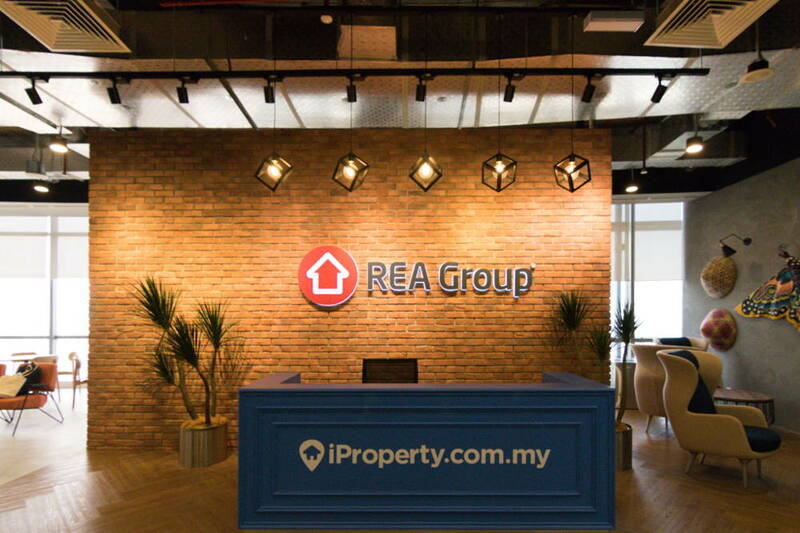 The penthouse of The Gardens South Tower in Midvalley City has just welcomed its latest and possibly most vibrant tenant, iProperty.com.my. 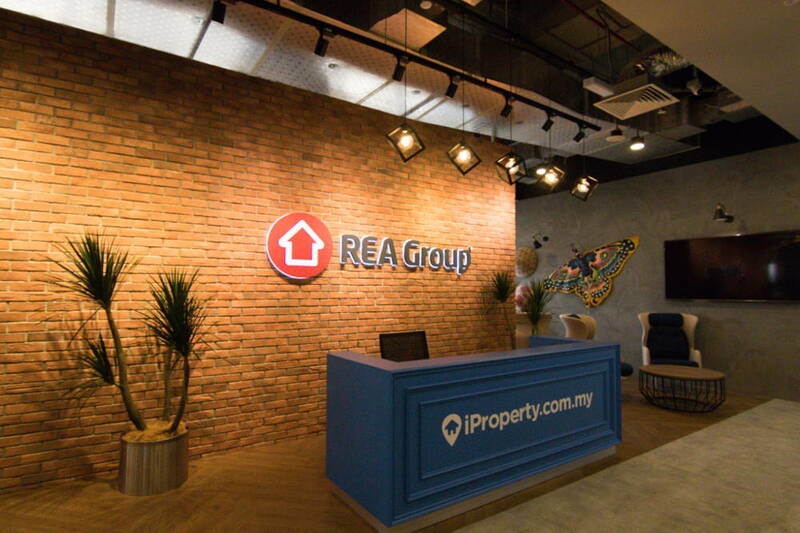 The company – owned and operated by REA Group – invited us for a tour around its whopping 16,000 sq. 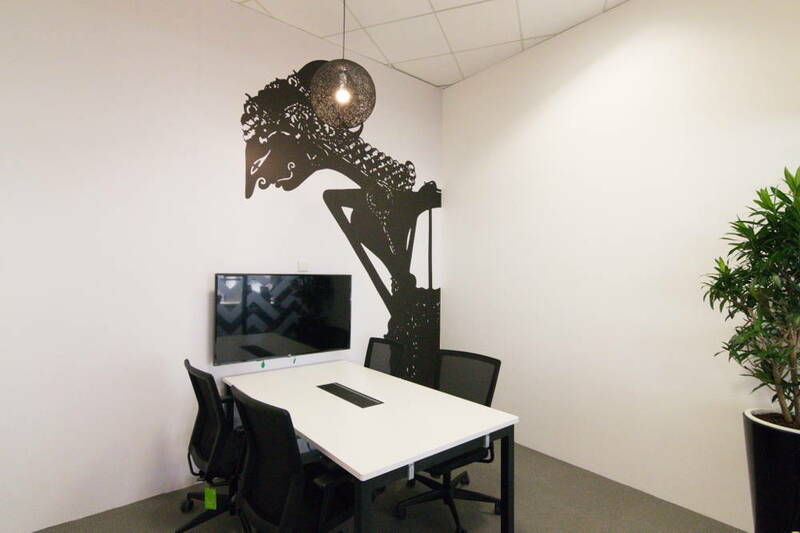 ft. work space that’s built to encourage collaboration between its 250 employees. 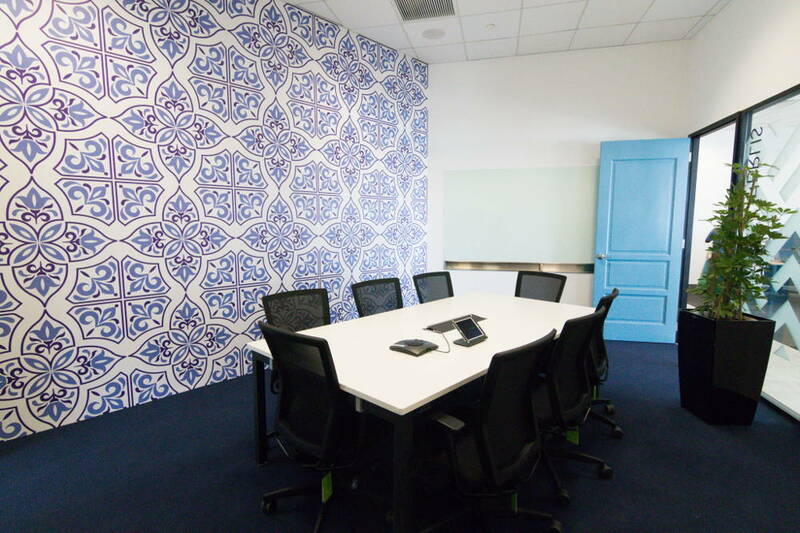 The space is not your traditional office stuffed with rows of cubicles. Instead, it’s a spacious and colourful outfit with inviting rooms and areas named and decorated after and in celebration of the Malaysian states. 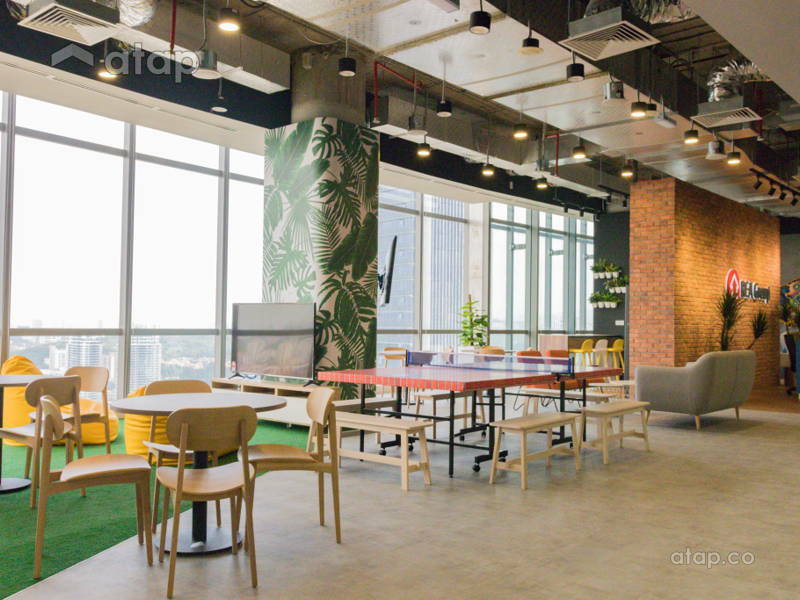 Step into the office and you’ll find yourself in ‘Sabah and Sarawak’, a colourful and lofty common area. Beside the rustic brick wall that greets you is a pantry area by a feature wall embellished with large farmers’ hats and an intricate butterfly wau. Follow the sights and sounds of freshly brewed coffee and chit chat and you’ll find yourself in a charming pantry with wall plants that match the palm wallpaper on a large pillar in the centre of the room. These, along with potted plants are the greenery that’s reminiscent of Borneo rainforests. On the other side of ‘Sabah and Sarawak’ are a foosball table and a ping pong table that’s also used for dining. 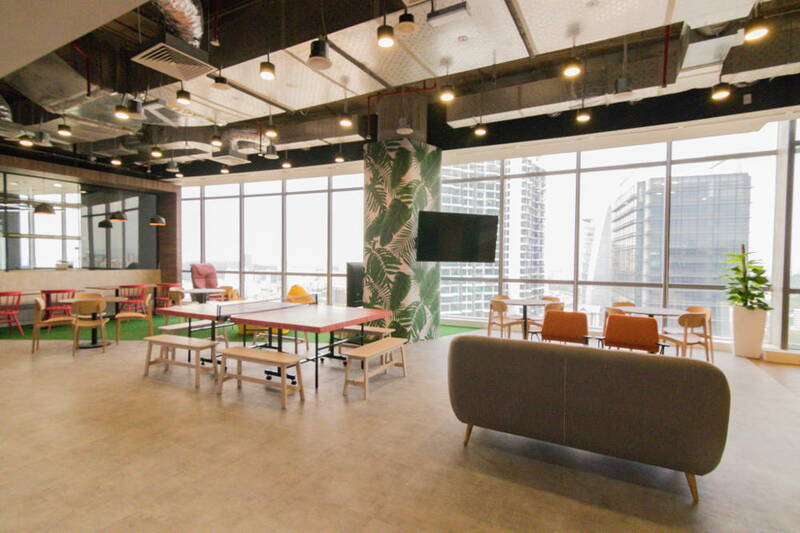 You’ll also find café style seats and benches along with bean bags, a flat screen TV fitted with the PS4 game console; and the pièce de résistance, a massage chair that sits by the ceiling high windows and a picturesque view of Kuala Lumpur. iProperty.com.my takes innovation and collaboration seriously, and this is evident in its wide variety of gathering areas to accommodate groups of different sizes and discussions, work-related and otherwise. 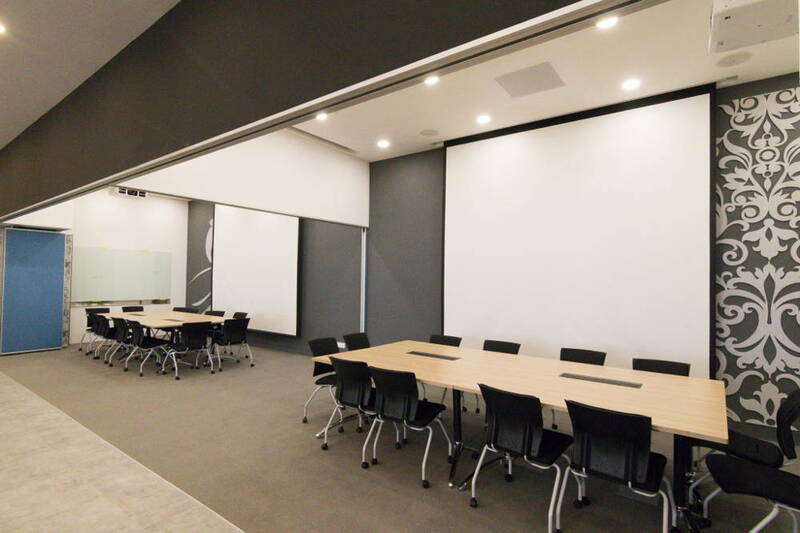 The ‘Sabah and Sarawak’ common area also includes a large conference room with folding doors that open up to the rest of the space for company-wide meetings. 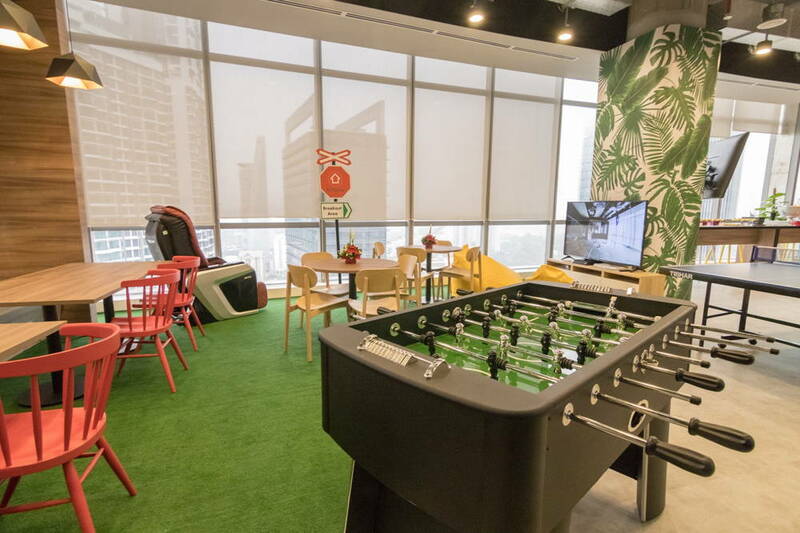 Playful elements aren’t just reserved in the common area, as the open-space desks and meetings/conference rooms (all 12 of them) are equally inviting. To encourage conversations within and between teams, employees are not assigned to permanent desks. Instead, teams are allocated areas with lockers that they can personalise. Every room and area is inspired by a Malaysian state or location. 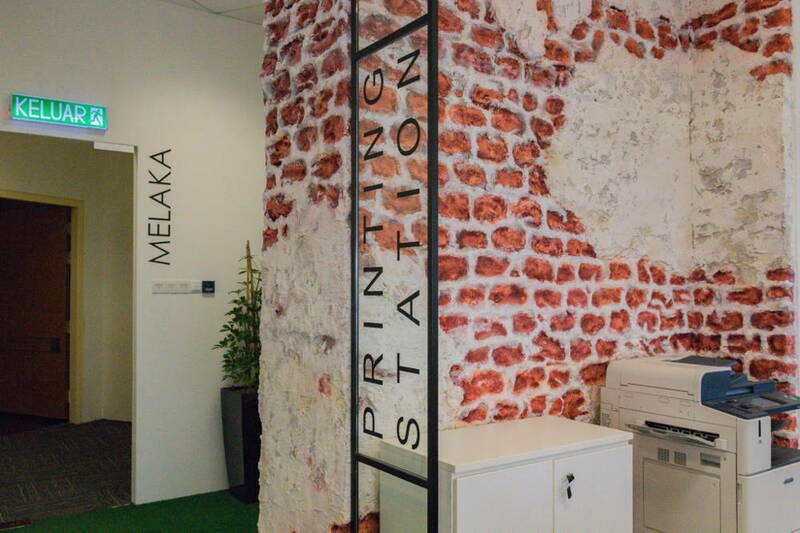 Melaka, for example, is a printing station with walls constructed to mimic the old brick walls of the A Famosa. 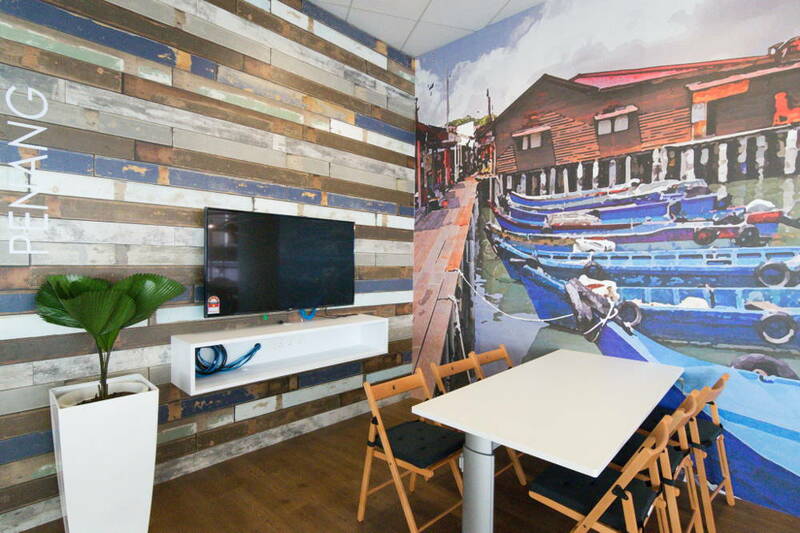 Meanwhile, Penang has a feature wall with an image of the jetty, and ‘Kelantan’ boasts a wayang kulit wall sticker. 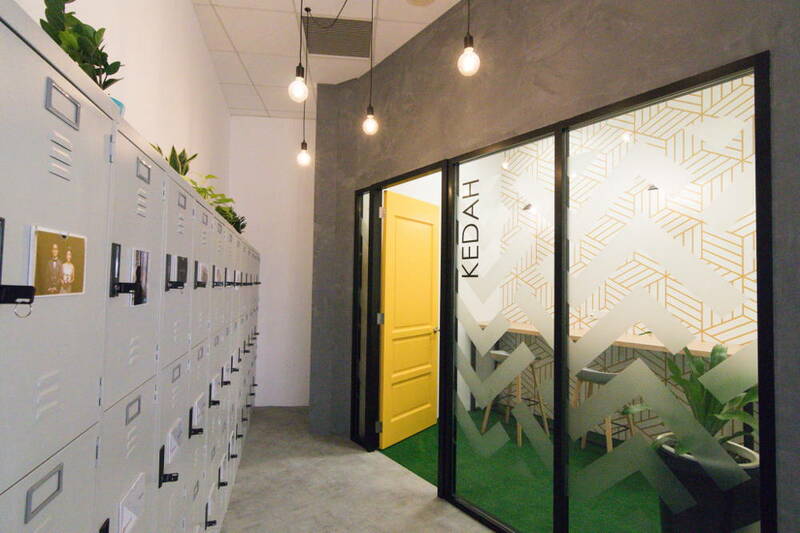 Besides meeting and desk areas, the office houses 3 quiet rooms where people can work individually or in small groups and breakout spaces that are semi-private like the Terengganu library. 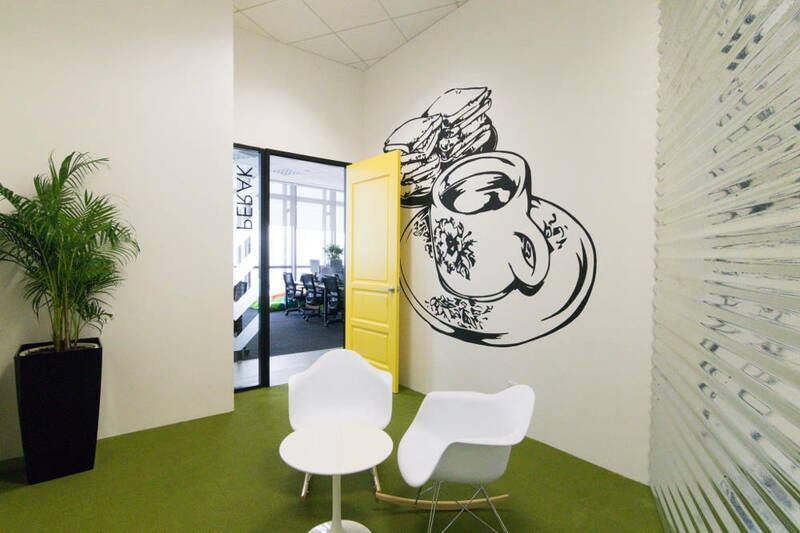 Another notable section is the open-space collaboration area located near the second pantry. 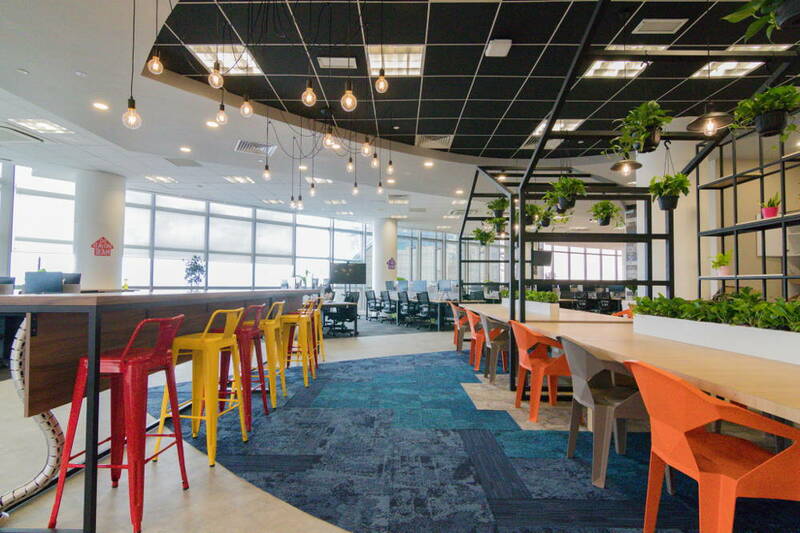 The space features long desks with bright coloured seats, and lots of plants. 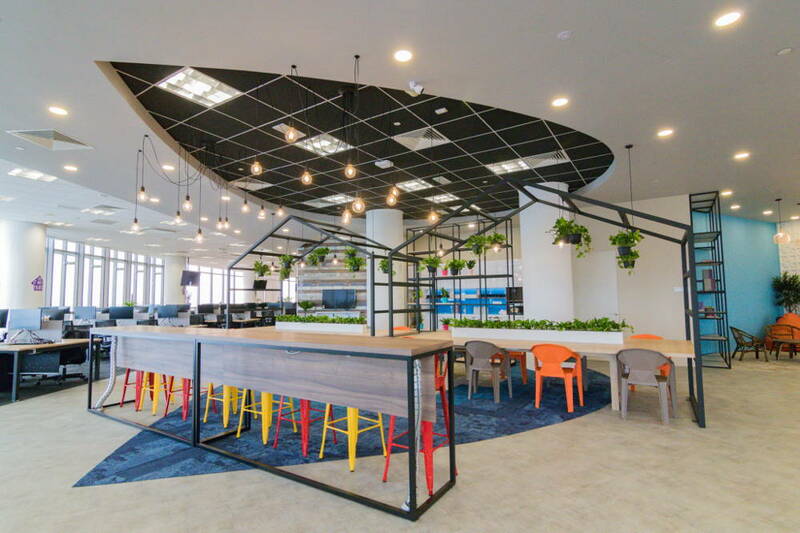 It’s ideal for employees who want to break away from their desks, or for those who want to munch and chat, or even grab a quick bite while working. The area even has plants hanging from two steel structures that look like the house in the iProperty logo. 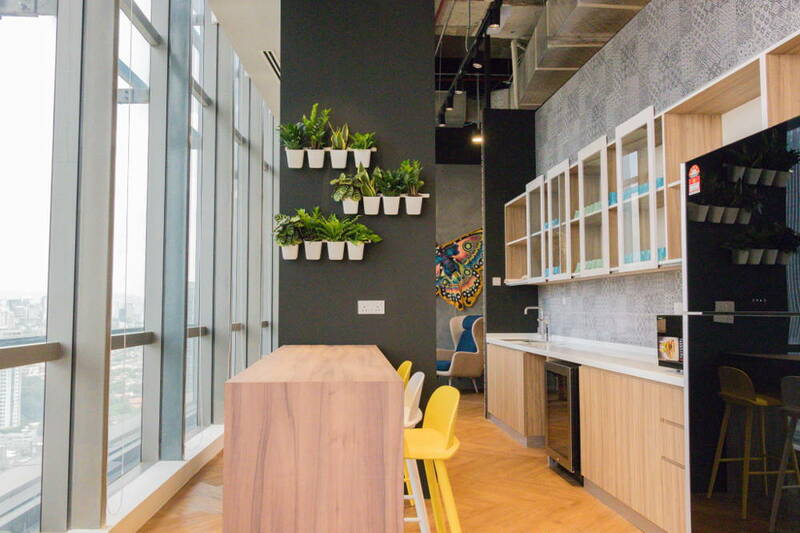 While the office pays homage to traditional Malaysian elements, it is also embraces modernistic industrial facets such as the exposed ceiling, concrete-finish walls, and black-rimmed glass doors. But it isn’t just the design and structure that embodies current and futuristic elements, it’s also the company’s emphasis on technology and innovation. The Cyberjaya room, for instance, centres around a TV screen attached to Virtual Realty (VR) technology. Every room is also fitted with a flat screen TV, and an iPad at the entrances so employees can place bookings for room usage.